Often, books are praised too quickly, when they are basking in the warm days of their launch…when positive reviews are sometimes tied to backroom handshakes and the cozy blurb reciprocity of authors’ frends. I avoid taking recommendations from friends for fear of not liking the book and having to tell them. I evade book clubs too, even though I’d love to join the literary fun. In the period between the sizzle of book launch and the fizzle of declining sales, I may buy a book, however, I sequester it away until the white noise of its newsiness has died down. If the book becomes a bestseller, it may sit on a shelf for years before I even crack the cover. Simply said, I am skeptical of anything that shines too brightly and quickly and leaves a comet’s tail of transitory appeal. Russell Perrault, VP/Director of Publicity for Random House, posted on his Facebook wall that Stoner was one of his favorite novels. I vaguely knew Perrault and I had never heard of the author, John Williams (1922-1994), which seemed in perfect synchronicity with my book buying habits. A few of Perreault’s FB friends posted emotional praise for the novel too. 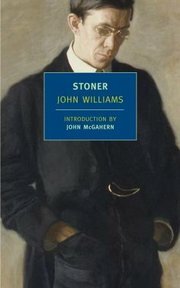 John Edward Williams grew up in Texas, lived in Denver, and taught at U. of Missouri (which it appears his book Stoner took cues from). He also won a National Book Award for another novel, Augustus. Thus I bought it, curious about an obscure book from an obscure author, recommended by people I didn’t know. Stoner was reissued by New York Review Books in 2006 (it’s 20% off on their website today). Oh, wow. I can’t wait to read. Thanks, Kerri. I’m sure you have loads to read already, but do take a peek at this wonderful book when you have an open two days… cheers.